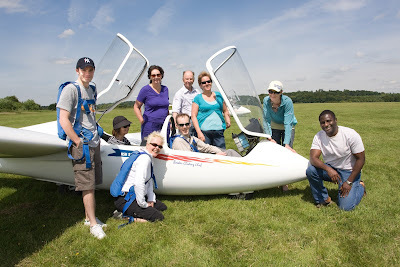 Pleasant weather, good company, fun flying - just what was ordered for our visitors from JLP (other retailers welcome). A good high cloudbase, thermic from the very start of the day, with clear visibility offering views from Canary Wharf to Oxford and beyond. Thanks to Jeff Hopkins for the pictures and an interesting view of a loop! Nice day, shame about the wind. Great lift from the start, very smooth and powerful - none of that sharp edged stuff today, just enough to keep everyone on their tows. 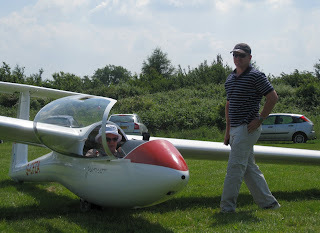 After four hours of briefings yesterday, Claus and Angelique finally got airbourne today and managed extremely well! George and Will both had a soar as did Mike and Emily before things got just a little too much. Not to be left out Tim declared Marlborough out and (very quick) return. Meanwhile we put everything else away whilst Dave B led the remote launchpoint in some intense discussion. Nils said it would be a good day but windy. Then added but not a problem for an ASW27 or a Nimbus 2. That was almost a challenge that couldn't be ignored. 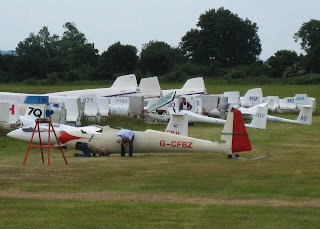 At the airfield Bob had already rigged 949, Jeremy LDV, then Roger turned up and rigged FUN and then Roy who was allowed the pleasure of Z3 as Tim was into house modifying mode. The launch point was cluttered with a helicopter left over from Expo and the others were taxying around as though we weren't there, I'm sure they'll get back to normal eventually. 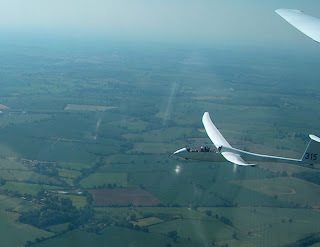 The task was decided as an into wind to Marlborough back to Thame Airfield and then into wind again to Membury and an assisted glide back to Booker with what turned out to be a 25knot tailwind. Just myself 918 and Bob 949 were going to attempt it. Jeremy had set himself a modest Membury Chieveley, which I don't know how he got on as he wasn't around when I got back. 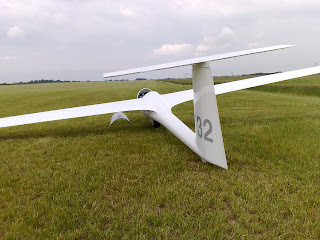 The only problem was whether cloudbase was high enough to take a launch. 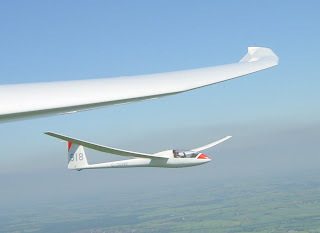 Problem was solved when the 11.15 trial lesson arrived and Julian was able to inform us that cloudbase was over 3500 and climbs were 4knots. (Well we had to believe him didn't we). After the launch I thought I was going to end up back at the launch point and go nowhere. Eventually I got high enough to start. Soon after that Bob was checking the Benson frequency as it looked highly likely a land out was in the offing, although he managed to climb away okay. 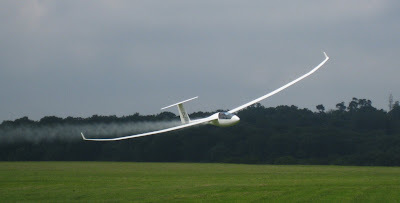 Anyhow the run to Marlborough was was anything but fun as the wind was giving a glide angle more like a K13 than a Nimbus and chosing a place to land became a feature of that leg. Although looking at the clouds in the picture you'd neve believe that find a climb was difficult. Once round Marlborough life became much easier and the day got better by the minute. The run to Thame took a couple of thermals and the into wind leg back to Membury was a real pleasure with strong lift lining up more or less along track. The day was gradually blueing out (not at all as the forecast which implied spreadout) but even so a street lead the way back to Booker and the only problem was not being able to fly fast enough in the old bus. It turned out to be a great day (Sorry Jim if you were put off by my remarks) which only a few of us had the pleasure to fly on. Despite the debris from Aero Expo we soon had the kit out, albeit a little mixed up withWarriors and Robinsons which departed throughout the day. Fabulous streets formed very early on but faded slightly with the increasing top cover. Some fettling was in order before the off. By mid afternoon the sky to the Northwest still looked good with strong lift and a high cloudbase. Viz was pretty good too! However the skies to the Southwest beyond Didcot had already started to turn, putting paid to the tasks of the late starters. Nice to see everyone back though! Who said it would be a "thame" weekend? Lots of fun was had by all! Some photos from Gerry -"thanks to our excellent hosts and to all who came along". Oh and by the way Martin FF, John H, Heggie and yours truly all had fun today retrieving the 21's, shame to waste that sky! 'Meet the Neighbours' Summer Fair. 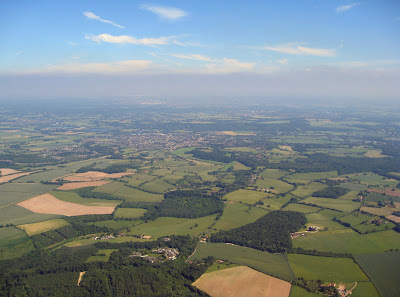 It was JLP's first event of this kind so no-one knew what to expect, but since they are just across the M40 from the airfield and we share the same neighbours, it was an opportunity to make friends and influence people. 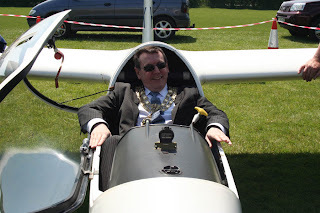 Sitting in a glider seemed to make quite an impression on the mayor. And Chris was successful in persuading the police to book a group event, not sure if it was the smooth talking or the hammer. From 13 to 15 June Wycombe Air Park was closed to make way for AeroExpo. 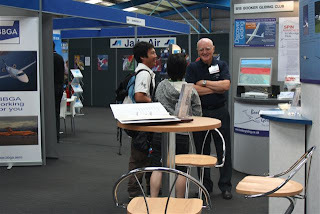 Our hangar became one of the exhibition halls, we set up a stand and parked out the Duo Discus. 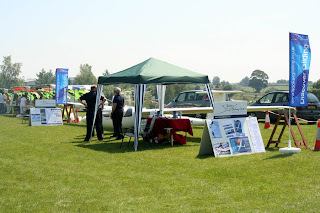 We made a number of sales and plenty of useful contacts, a successful weekend, even though we missed what looked like some very good soaring weather. It could have been a 300k day. It just lacked the weather. After yesterday when a sky full of great cu gradually turned blue and made the North part of the 300k around Tetbury, Husbands Bosworth into a bit of a nail biter the post cold frontal scenario of today made us much more confident. A9, Z12, 918 and 315 set off, a good 3/4 of an hour after Dennis had launched in 370 with a view to using the South Downs, on a reverse task of yesterday. Hus. Bos - Tetbury. Cloudbase was just about 3k with what appeared to be cu forming to the North. 918, 315 and A9 set off full of confidence in a great day out, but by the time we reached Buckingham it was already obvious that a 300k wasn't on. I think,although I'm not sure, once we'd managed to escape the feeling that a landout wasn't going to happen just yet that Glen (A9) must have headed for home. Z12 having started later was pushing for Milton Keynes whilst 315 and 918 struggled for Towcester. Once past Towcester it still looked possible with haze caps forming ahead, although any climbs were weak and petered out between 2000 and 2500. Then Z12 called a likely landout, followed by actually landing out. 315 spotted him in the field talking to the farmer. This gave us both the idea that pushing on wasn't a good idea. Plan of action was to find a climb, this happened just off the N/W edge of Northampton, then strengthened by a climb over the largest white roof next to the M1, was to go via Silverston and on with Bicester in mind and ever onward. Silverston obliged with the b est climb of the day to 3000. Another climb just of to the S/W of Wescott, then Thame and we were home. 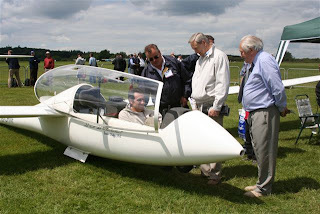 The pictures were taken during the run from Northampton to Silverstone. These give a good idea of the sky looking West and East. Dennis having listened to Z12 landing out, volunteered to retrieve him on landing himself, but it turned out the Glen having go back earlier went for him. It didn't turn into a 300k day but I'm sure Geoff Tabner enjoyed his checkout in the Duo. Well for me at least. Nice to have a short break after what has been the busiest week of the year so far, particularly after playing musical aeroplanes yesterday in the run up to Aero Expo. There's nothing quite like a swept and carpeted hangar in which to store our kit, just let's hope it doesn't rain. 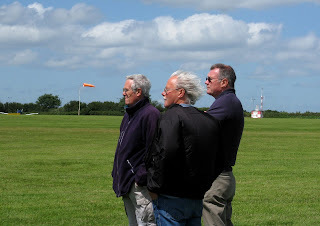 Congratulations to Jeff W who managed his Silver Duration, to Don H who completed his Cross Country Endorsement, to John W who converted to the K18, and to Leon who also flew the K18 for the first time and got a Bronze Leg into the bargain. 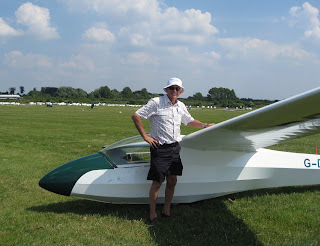 Also well done Kevin who flew the Junior before his imminent return to Zimbabwe, hope to see you again, and to Roy G who has re-soloed after a few months layoff. Back again are Matthew E and Michael G who I'm sure will be quickly back into the swing again. Hope you all have a great weekend at Thame and/or Aero Expo! Went to Booker this morning for Jim White's x-c lecture and didn't actually intend to go x-c because of the complete mass of confusion/disagreement of forecasts from the various sources. Metcheck suggested an 18kt wind and yet the synoptic charts showed few isobars over the Country. Surely one of them was wrong ? RASP meanwhile predicted broken thermals, decaying away by 14:00 and plenty of rain rolling in from Kent and developing over the whole South-East. Only one thing to do under those circumstances.....look out the window! So, after the lecture we stepped outside and....bl**dy hell!...the sky looked awesome. What on earth where we doing on the ground still? Anyway off to the trailer park to rig (several of the folks on the task week had sensibly rigged before the briefing). Down to Asda to buy some emergency supplies (I don't thermal well on an empty stomach). Returned in time to learn that the club task was BOB-MAR-OXF-ENS-BOO (198Km).....or something similar. Launched into a good looking sky, Cu building and growing nicely, top cover staying well to the East. Several other launched around the same time, so all signs were good. 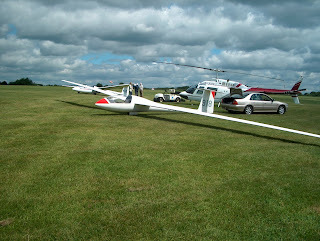 Set up for a start at BOB accompanied by Libelle 7Q and JDV nearby. 918, 949, 607, 971 and others had started shortly before. Messed the start up, so restarted a few minutes later and everybody had disappeared! Just how does that work? Anyway, set off on track and ended up at 800' just near the edge of Benson's ATZ. A low scrape so soon ? 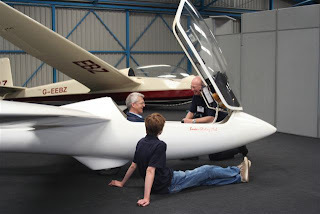 This gliding really is filled with highs and lows of a physical and emotional nature. Anyway, a 2.6kt climb was found and stuck with until 2800'. Made it to Marlborough and the sky on the next leg looked great. Jim in Z12 caught up and I followed him for a while as he headed North. Pondered going a bit further left to work some Cu but figured I could take a more direct track following Jim across a bit of a blue gap (note to self - don't be silly, follow the energy, not other gliders). Ended up scrabbling around a bit at 2200' assuming Jim had done much better. He hadn't. Anyway, made it to Oxford East (surprising how far North it is when you can see the sky decaying ahead) and elected to head home. 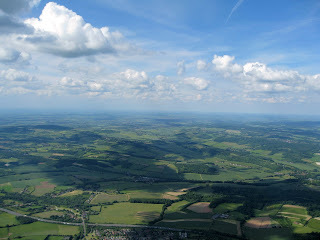 Home wasn't as close as I'd like when at 2200' so topped up in a 3.6kt climb to 3300' and hot footed it to Thame Airfield. The sky was looking really dead by now and none of the hotspots were working. Played around in a couple of turns at 'not very high' with a pair of Red Kites before deciding that they were just playing 'bait the big white bird'. Levelled the wings, lowered the gear and touched down on the freshly prepared airstrip. Great field! The gliding club wasn't operating today but a tractor still quickly appeared to tow me back to the launch point and another member ran the wing when Booker tug 'MM' arrived to tow me home (thanks chaps). Turns out that others had found it challenging too. Phil Cuming in 971 landed out at Draycott Farm after turning Marlborough. Steve Williams dropped into Thame shortly after I was towed out. 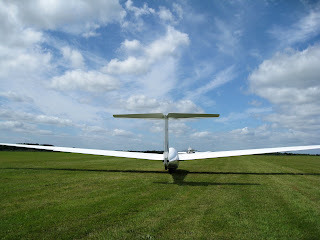 Not sure how everybody else did but there's flights now appearing on the BGA Ladder (http://www.bgaladder.co.uk/Enquiry.asp). Spoke to a couple of p[ower pilots once back at Booker. 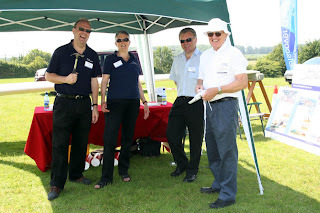 They were helping with the BAFC Navex and spot landing competition. 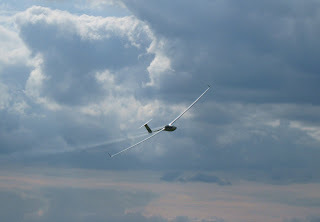 Turns out that we were doing a bigger task in gliders than they were in their Pipers! Still, each to their own. Overall, nice day out but far too much like hard work but it was a very good landout field! 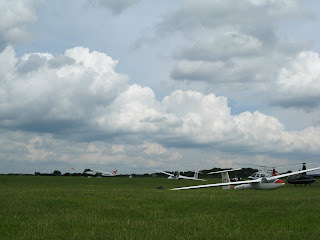 Another busy day at Booker with twenty plus gliders flying in the task week day 6. 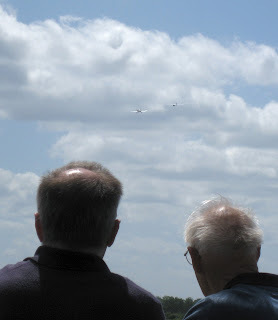 Hopefully Dave or Gary will post something on what they did whilst the rest of us kept the visitors and club members happy local soaring. Quite a mixture of skies, some which appeared classic but failed to live up to their promise, others which allowed 949 to cruise home at 120kts struggling to lose height. Early afternoon the sky darkened and the radio crackled to suggest a heavy shower was imminent, but nothing materialised, allowing Graham to continue to fly his aerobatic lessons - amazing just how quickly you can climb to 4k under a decent street! I stopped work on the ark at the weekend, probably too soon looking at tonight's merry forecast from the met office. Low viz with a cloudbase to match marred the morning's play and pavillion fever was beginning to get a grip again. However we did manage a few overs this afternoon with Kevin L converting onto the K21 before rain finally stopped play and we decamped to the Live and Let Die. Wednesday looks good. And the grass will be nice and green after tomorrow's deluge. It's that time again. Summer has finally arrived, well almost. The grid formed, coffee'd, exchanged war stories, launched, landed and de-rig'd. Never mind it will be better tomorrow, hopefully. 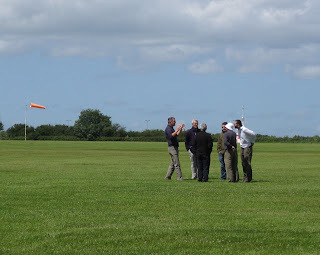 For the rest of us the day proved a busy mix of trial lessons, courses, training and member flying. 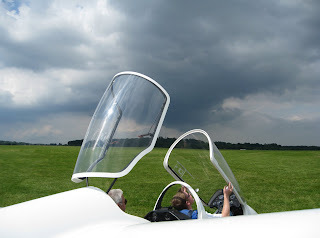 Cloudbase started at 2200 lifted to 2900 throughout the morning and finally ended the day high enough for some aerobatic competition between Alun and Gary (all figures optimistically stated as QNH). 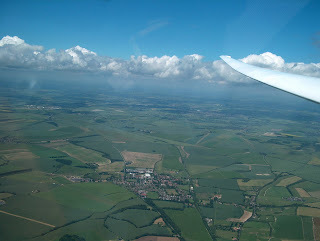 Visibility was the real problem early on particularly around cloudbase in our crowded airspace. Not much Mode S would do about that methinks. Stick to the Mark 1 Eyeball.